Children's welfare is the driving force behind Dr. Laura's mission. A devoted mother to her son, Deryk, she identifies herself as "her kid's mom" because that's her most important job. Never one to shy away from tough truths, Dr. Laura marshalls compelling evidence for the widespread neglect of America's children and convincingly condemns the numerous rationalizations to excuse it. Parents, special interest groups, and professionals in education and psychology all contribute to a dangerous trend that places adult fulfillment above obligation to children. Stupid Things Parents Do To Mess Up Their Kids addresses the serious causes and effects of this national crisis, among them the high rate of divorce, serial marriages, single parenting, the premature sexualization of children, dual-career families, disdain for religion, the redefinition of immoral behavior as lifestyle choices, and societal intolerance for the concept of judgment. 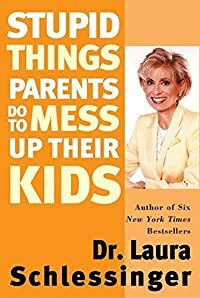 In Stupid Things Parents Do To Mess Up Their Kids , Dr. Laura exhorts parents to make their own children their top priority and, if necessary, to change their lives to do so. In her inimitable, straight-shooting style, Dr. Laura entreats parents to involve themselves in their children's hearts, minds, and souls, to cherish and protect them, and to commit to the essential task of teaching them right from wrong. She acknowledges parents no longer get much support from neighbors or public and private institutions, but she urges mothers and fathers to work even harder to counteract the prevailing culture of selfishness and irresponsibility. Stupid Things Parents Do To Mess Up Their Kids covers all aspects of parenting, from childbearing to discipline, from multiple families to being role models. Dr. Laura also tackles such cultural and societal concerns as abortion, modern sexuality, drug and alcohol use, violence, discipline, and a child's right to privacy. Stupid Things Parents Do To Mess Up Their Kids is a passionate and provocative summation of the perils of parenting and a road map to safety for America's families.